My grandma knew how to make the best pies every year for Thanksgiving. The crust is tender and flaky and so easy to make! You will never buy from the store again! Every year we would look forward to going to my Grandma’s for Thanksgiving. She was the BEST cook that I know. She raised 8 kids and had a home cooked meal on the table for them each night. She spent all of her time in the kitchen. She made all of her own bread by hand and was amazing at making anything from scratch. I remember staying for a few weeks with them in the summer and she was always baking bread or a batch of peanut butter cookies. As soon as the warm bread came out of the oven she would slice it up and we would eat an entire loaf. She was an amazing baker. The best part about Thanksgiving was her pies. You couldn’t wait to finish the meal to have one of her pies. I have yet to try a better pie. She would make them all herself and you couldn’t get enough of them. Her crust was tender and flaky and perfect. In my opinion the best! 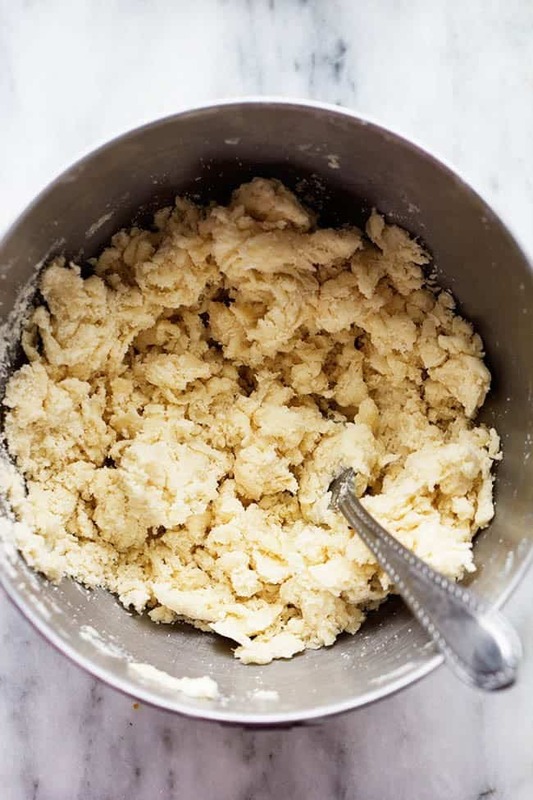 Sometimes making any kind of dough from scratch can seem intimidating but today I am going to show you how easy it is! The crust comes together in just a matter of minutes and you probably already have all of the ingredients on hand. You combine the flour and salt in a medium sized bowl. With a pastry blender you cut in the shortening until it is pea sized. Next, sprinkle cold water one tablespoon at a time tossing the dough with a fork. Push moistened dough to the side of the bowl and mix until all of the flour is moistened. Don’t over mix or the crust will be too hard. Put the dough into the pie dish and trim the edges. And viola! 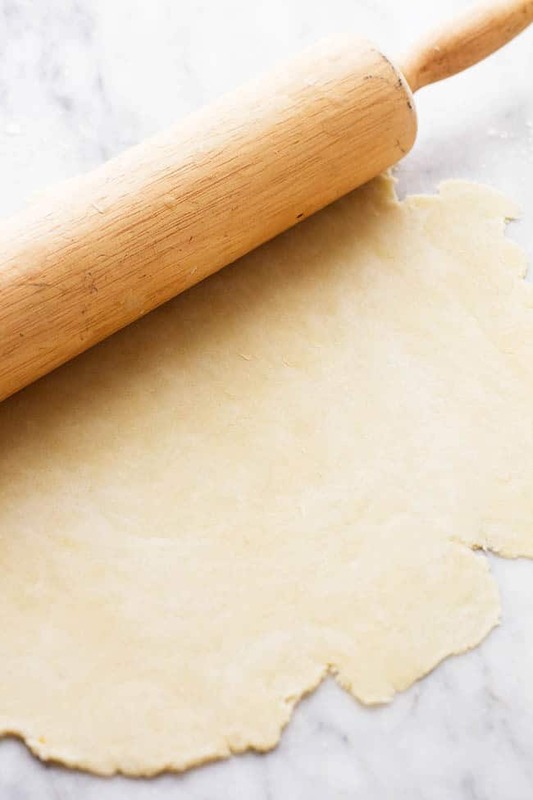 You just made a pie crust. See how easy and not intimating that is? Now you are ready to fill the pie with an amazing filling and bake. 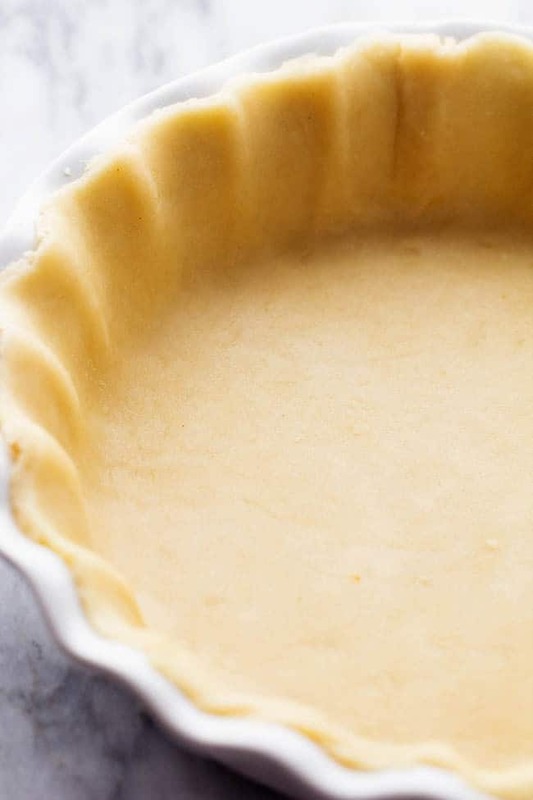 This pie crust is so easy and perfect you will make it again and again! In a medium bowl stir together flour and salt. With a pastry blender cut in shortening till pea sized. Sprinkle water on one tablespoon at a time tossing with fork. Push moistened dough to the side. Mix till all flour is moistened. Don't mix too much or crust will be hard. Form into a ball and roll out on floured surface. Turn and flour dough a few times till its the size you need. You make this seem so easy. 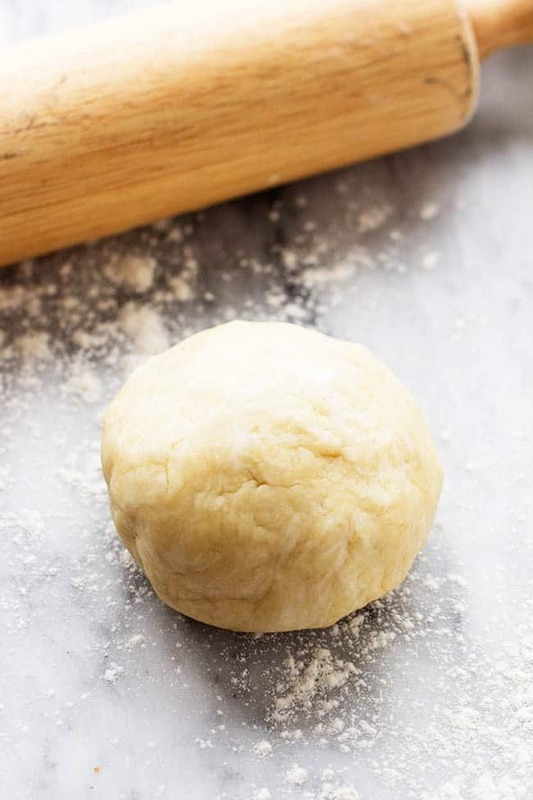 How did you crimp the dough to make it look so different? Pinned for future baking. Thanks for sharing. Can you please tell me what type of shortening you use? I often see ‘shortening’ listed in American recipes (I’m in Australia) and am not sure what you are referring to. 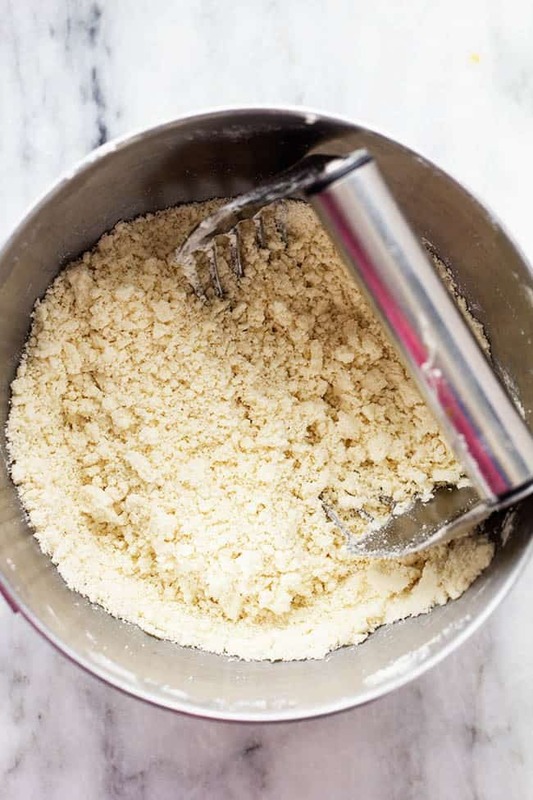 Shortening here is used as an umbrella term for any type of butter, fat/lard or solid oil type of product in baking – and our recipes specify which one is required. This looks like such a great recipe that I’d hate to spoil it by using the wrong ingredient! I used crisco. Butter shortening is also a great alternative. Yes, simple piecrust made with only 4 ingredients! Real similar to the recipe I’ve been making for over 40 years. I use 1 1/3 C flour to 1/2 cup shortening. Perfect for my 10 inch pie plates. And I use ice water. 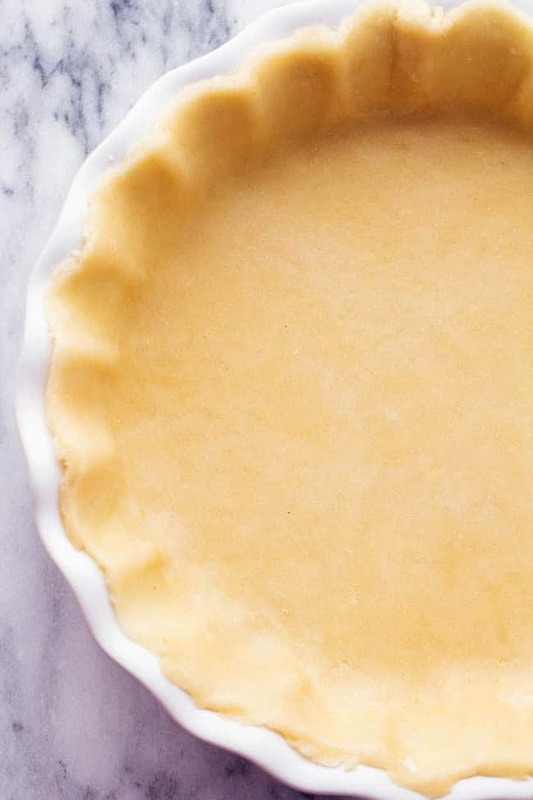 Thank you for posting Grandma’s Perfect Pie Crust recipe! I have tried dozens of recipes but could never get the crust to stay together. It makes me happy to be able to make a good pie crust that not only stays together but tastes fantastic!!! Does this pie crust dough need refrigerated prior to being rolled out? Also, does this crust freeze well? I am freezing Dutch Apple Pies to bake later. So you don’t have what temp or how long? Your recipe does not indicate that the shortening should be chilled or refrigerated. I do not refrigerate my shortening, is it necessary to refrigerate it to get it to ‘cut in till pea sized’? What size of pan does this work for because I only have a 9 inch pan, will that work? Yes, that is perfect! Now for the perfect pie crust:)! Enjoy! What kind of shortening do you use and is it cold? Hi! can you use butter instead of shortening? For those wondering about refrigeration….not necessary. When you add eggs and vinegar as in the other recipe you do need to. This rolls very nice! Can this recipe be doubled. I have the worst luck with pie crust so I’ll give yours a try.